﻿ Embassy of India, Ankara, Turkey : News - Hindi Scholarship for the Academic Session 2019-20 under the Scheme of Propagation of Hindi Abroad at Kendriya Hindi Sansthan, Agra. 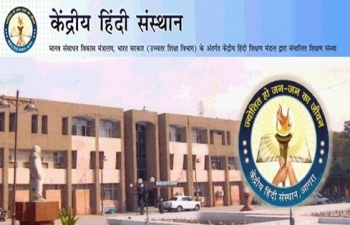 Hindi Scholarship for the Academic Session 2019-20 under the Scheme of Propagation of Hindi Abroad at Kendriya Hindi Sansthan, Agra. Kendriya Hindi Sansthan Agra is inviting application forms for learning Hindi language under the scheme of "Propagation of Hindi Abroad at Kendriya Hindi Sansthan" Agra, for the academic session 2019-20. The age limit for applying this course is 21-35 years. The scheme is administered by the Ministry of Human Resource Development, Government of India. The applicants may send their application form to the Embassy of India, Ankara latest by March 04, 2019. Procurement of Instruments and Up-gradation Laboratories, as per DPR, for procurement of instruments amp infrastructure improvement-reg.